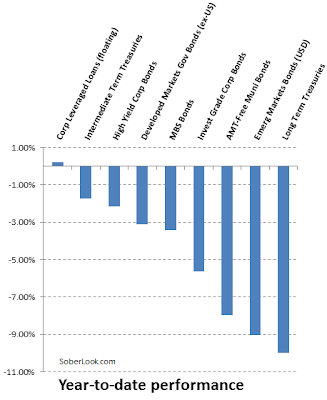 The following shows the returns of stock markets around the world post financial crisis. China (my favorite market to buy stocks during big sell offs) has not enjoyed the returns experienced by other major markets. While China's market is going to experience tremendous turbulence over the years ahead, if I were a 20 year old putting money away to retire 30 years from now it would be almost exclusively focused in that region. The fixed income markets year to date have seen bloodshed, something they are certainly not accustomed to. A recent poll conducted by Edward Jones found that 63% of average Americans who invest in the market (mostly through their 401ks) have no understanding how bond prices work or that they can fall in value. When they open their quarterly statements in the mail for quarters two and three it will be a very unwelcome surprise. The following shows the largest bond corrections during the 30 year secular bull market (which may be over as I type this). 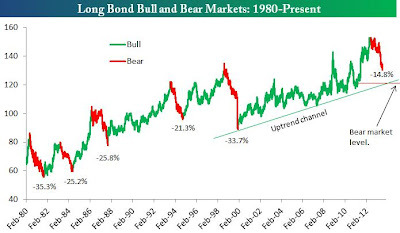 The current 14.8% sell off has always been a buying opportunity during the past three decades. Is this time different?